Acer is set to launch a new Ferrari-branded netbook later next month, with the company celebrating the launch of the Acer Ferrari One at a recent high-profile launch event at Ferrari's legendary Monza racetrack. Acer's Ferrari One is a decent enough netbook and is sure to appeal to boy racers in the market for a mini-computer when it launches in October, with an (un-Ferrari-like) price-tag of £393. While it is far from a premium model netbook, the specs are decent enough for the price, with the Acer Ferrari One boasting a dual-core AMD Athlon X2 L310 1.2GHz CPU and 2GB of memory, an 11.6-inch screen with 1366 x 768-pixel resolution and an ATI Radeon HD 3200 GPU graphics chip. 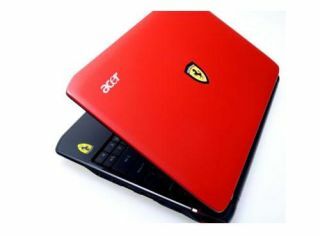 In addition to that famous prancing horse badge and liberal splashes of red gloss on its bonnet, Acer's latest netbook also packs in a 250GB hard drive, a multi-format memory card reader, Wi-Fi, Bluetooth and 3G connectivity. What Laptop – part of the TechRadar network – were treated to the first hands-on with the new Acer Ferrari One, noting that it is the first netbook they've seen to feature the dual-core processor AMD Athlon X2 L310 chip. "Running at 1.2GHz, it's broadly in line with Atom-based rivals when running single applications, but should prove noticeably better when carrying out multiple tasks, such as carrying out a virus check while browsing the internet," adds What Laptop. "The relatively large screen creates enough space for a keyboard that's pretty much full-sized, and it provides great usability. With a decent amount of travel, and firmly attached keys, it's easy to type at speed, and it adds a feeling of quality often lacking on netbooks. "The touchpad supports gesture control, letting you rotate and zoom into images and documents – as with several of Acer's other netbooks." For further details on the new Acer Ferrari One, head over to What Laptop's hands on review.